Handwork not for you? Learn to applique using your sewing machine with this fabulous Laura Heine Pattern, Garden Party! It's all about that flair when you're showing off your sewing talents! Using the Shortcut Binding Tool, you'll be able to make a flanged binding and a two colored binding (one color on the front, another color on the back). You'll wow everyone when they see your binding skills! The last step in finishing your quilt! Learn how to paper-piece in this beginner class and make exact blocks every time! 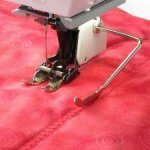 Is free-motion quilting a scary prospect for you? 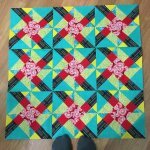 Why not try ruler quilting? Ruler quilting on your home machine is a great way to let your quilting shine on your quilt!